McCollister home above Antelope Flats, 2015. Grand Teton National Park has issued a new Historic Properties Management Plan. I have submitted the comments below in response to that plan. These comments (1) address especially the plan's development and use of a novel Historic Property Evaluation Tool and (2) suggest some of the limits of that tool by discussing the McCollister Complex; because the McCollister Complex was evaluated as significant at the LOCAL level and because it is not in CURRENT use, the property scores low on the HPET system and is placed in a group recommended for demolition or removal. I submitted a set of comments on February 12, 2016, but then found in the Historic Properties Management Plan, on page 73, a paragraph providing for consultation with the Advisory Council on Historic Places and the Wyoming State Historic Preservation Office prior to removal or demolition of a resource. This is contrary to what I had written in my February 12 comments where I discussed future historic resource management at Grand Teton National Park. That was a serious mistake and I have submitted a new, corrected comment to Grand Teton along with an apology for my misstatement. The comment I submitted on February 15 to replace the earlier comment is below. So I apologize not only to the park but also to readers of this web page. I hope that any whom I may have misinformed will check back to this site and note the corrected comment below. Grand Teton National Park has the good fortune, because of the circumstances of its creation, then of its expansion in the middle of the twentieth century, and after that its piecemeal addition of private inholdings, to embrace within its boundaries and within its responsibility a great many cultural resources that have been determined eligible for the National Register of Historic Places. Those resources present GRTE management a significant opportunity for helping the American public, and also the Jackson Hole community, to understand and explore important contours of our past. One can appreciate the challenge and complexity of managing a great many historical resources, but this challenge has huge benefits when done with respectful attention to their needs, with mindful care in their preservation, and with professional sensitivity to their interpretive potential. It is with that potential and that responsibility in mind that I address my comments to a specific component of the January 5 Historic Properties Management Plan. At the heart of this management plan is the Historic Property Evaluation Tool (HPET), by which 44 resources are evaluated and ranked (p. 37). This “tool” contains serious problems that detract from and diminish any value that it might otherwise have in providing management guidance. The immediate problem is simply that the HPET seeks to evaluate properties that have already been evaluated and found eligible for the National Register. Instead of accepting the resources that GRTE has and seeking the best ways to preserve, use, and interpret them, this plan, through this device, provides a rather complicated-looking system of ranking them, a system in which some of the properties can be removed. This is, alas, somewhat reminiscent of the attempts of GRTE superintendents in the 1990s to rid the park of valuable historic resources, efforts documented in Robert Righter’s recent book on Grand Teton National Park, Peaks, Politics & Passion. I thought we had moved far beyond that approach, but here we are again. For that reason alone, and there are other reasons too, the HPET deserves careful analysis before it is adopted. It is reasonable to inquire how well this HPET works when it comes to management of properties eligible for the National Register of Historic Places. Has this “tool” been used anywhere else? Has it ever been tested in a setting other than by this management team’s application of it to these resources? Was it devised in consultation with other cultural resource professionals and agencies outside of GRTE? The plan is silent on these questions. Until the plan clarifies and documents the development of this HPET, we can only infer that the HPET is untested and unreviewed outside the team that created it. This is unfortunate since several properties are being recommended for demolition or removal and others are being recommended for other management that may or may not be appropriate based on their scores on the HPET. The construction of this matrix reveals some curious, and disconcerting, features. The matrix categories are not standard; some are baffling, and perhaps even arbitrary, in their selection, both in what is left out and what is included. Shouldn’t we consider the resource’s condition, threats, and distinct potential, which are not matrix factors, much more than visitor access and current use, which are? Then, within the categories listed, the properties are scored and, just as the categories are selectively applied, the numerical score system within those categories appears to be highly subjective and carries a distinct bias against some kinds of resources and in favor of others. In fact, the scoring system (Appendix H) inexplicably ranks the locally significant eligible resources at the bottom and also ranks low any resources that are not currently in use, a quality that derives not from the resource itself, but from GRTE management preferences and decisions independent of the needs of the resource. As the saying goes in technology, this skewing of priorities is not a bug; it is a key feature of the system. We are not just talking abstractions here. The practical and real limitations of the Historic Property Evaluation Tool become evident when we look at the case of the McCollister Residential Complex, one of the three properties for which the HPET generated a recommendation for removal or demolition (under the Preferred Alternative B). In 2000 I was asked by resource managers from both Grand Teton National Park and National Park Service offices in Denver (1) to evaluate and (2) to nominate the McCollister residence to the National Register of Historic Places. While that nomination was never (to my knowledge) forwarded to the State Historic Preservation Office and the Keeper of the National Register for review, the fact that it was determined eligible requires that it be appropriately managed by GRTE. The nomination I prepared determined this property to be significant under Criterion B within the evaluation framework of the National Register of Historic Places. Note: for those who are unfamiliar with the National Register evaluation system, Criterion B applies to properties that are associated with individuals who were “significant in our past” at either the local, state, or national level. Given the significance of Paul McCollister in the creation of the Jackson Hole Ski Corporation and Teton Village, and the huge changes they generated, he obviously is a person of significance locally. The National Register also requires, however, that the association of the property with the individual be related to the specific contributions that made the individual significant. The studio of a significant artist or the workshop of an inventor would be examples of such associations. In the case of the McCollister residence, this was the place where Mr. McCollister developed the vision for what became the ski area and business / residential / tourist center at Teton Village, the place where he charted the plans for construction, the place where he brought consultants to hone ideas, to work out proposals, to secure financing, and to prepare contracts. This is the place where McCollister and his team formed the Jackson Hole Ski Corporation. The consultants and other participants in the creation of the ski resort across the valley often not only came here to discuss and plan, but they came here and they stayed in McCollister's guest cabins. In other words, it was at this site that Teton Village was invented. That was the ski resort that completely transformed Jackson Hole from what it was in the 1950s and 1960s to what it is today. In fact, this complex of buildings was less than fifty years of age at the time of its nomination and the site was determined to be of “exceptional” significance to warrant eligibility for the National Register. In 1994, when fighting a fire on Antelope Flats, Grand Teton National Park officials chose to use its fire-fighting resources to protect the McCollister Complex from the blaze, in the process sacrificing the historic Pfeiffer Homestead to the fire. There is disagreement as to (1) whether that sacrifice was necessary and (2) whether the correct choice was made, but no one seems to dispute that the McCollister Complex was a priority in preservation when fire threatened Antelope Flats resources. Given past evaluations and given the priorities expressed for preservation of the McCollister Complex, the assignment of a “Low Cultural Value” to the complex by the Historic Property Evaluation Tool is hard to defend and says more about the flaws in the HPET than it does about the property. The circumstances which doom the McCollister Complex are (1) its significance at the local level, and (2) GRTE’s decision not to use it at the present time. In fact the property is significant and it has, and has had, potential for reuse. Located on a paved road within the park, the property has easy visitor access. Having been used as a residence until 2000 when folk-singer and song-writer Tom Rush and wolf re-introduction leader Renee Askins moved from the McCollister place, the property has obvious potential for reuse as employee or other (e.g., visiting artist) housing. (McCollister’s Ski Corp business partner Gordon Graham urged me, when I talked with him in 2000, to help the place become the official residence for the park superintendent.) Yet the HPET score marks this resource as ready for removal or demolition. One can understand, and even sympathize with, the need and desire of resource managers to have greater flexibility in their management of Grand Teton National Park’s historic resources (and they are, in fact, resources, not just “properties” on a realtor’s inventory sheet). Life and work would be more stress-free and comfortable if they could sell off or change or move around the historic resources to meet other agendas. But the resources in the park that are eligible for the National Register of Historic Places need and deserve better and so does the public that looks to the park for deeper understanding of our past, for connections to the sites of lifeways, decisions, and moments that have shaped our present, and for a perspective grounded in the past as we look to the future. Just as wilderness is a source of solace and inspiration, the remnants of the past can be a source of wisdom, insight, and understanding. Applying that perspective, of course, is a daunting challenge for historians of all kinds and for managers of historic resources in particular. But I hope that Grand Teton National Park’s historic resource managers will embrace that challenge and develop a management framework that more directly addresses the preservation and interpretation needs of existing resources instead of calculating how to reduce the number of resources or finding ways to remove particular resources to meet other priorities. The public and the community of historians are more than eager to cooperate with GRTE in that bolder, richer vision of the use of resources, but they will balk at the implementation of ill-designed systems that either purposely or inadvertently place those resources on shaky administrative grounds. I have posted below a part of the National Register nomination for the McCollister Complex I prepared in 2000. The following is taken, with only a few edits, from the National Register nomination for the Paul McCollister Residential Complex that I prepared for Grand Teton National Park in 2000. While the McCollister residence overlooking Antelope Flats could easily be determined significant because of its association with the pattern of settlement of Jackson Hole, the closest and most direct association warranting eligibility is its association with a key individual responsible for shaping the particular course of development of the valley. Several prefatory notes need to be made: (1) The pattern of settlement has previously been outlined in Grand Teton National Park Multiple Property Nomination of August 1998 as one which includes the dwellings of settlers of the area, from the abodes of early homesteaders up to the hobby ranches, tourist homes, and vacation homes of more recent inhabitants of the valley. (2) The individual associated with this property, Paul W. McCollister, exercised unusual influence in the development of Jackson Hole as it made the transition from an area characterized by dwindling dude ranch activity, long winters of lethargic economic activity, and an unclear future for tourism to the flourishing resort based upscale community that it became. (3) The actions of this individual at this site, although within the past fifty years, proved to be of such exceptional importance as to warrant eligibility for the National Register. Paul W. McCollister was not an individual whose name was widely known outside Jackson Hole. In fact, there are likely many people in Wyoming who would be hard-pressed to identify him and his achievements. Yet this man, for better or worse in terms of individual judgments of what the area’s potential held, generated powerful changes that transformed life and economics in Jackson Hole. Paul McCollister lived permanently in Jackson Hole from 1953, part time, and from1957, full time, until his death in 1999. During this time, he lived in a series of homes starting with the residence on Antelope Flats. He remained at this residence until about 1965; in that time period he actively developed the vision of, charted the plans for, and began the construction of the resort complex at Teton Village on the other side of the valley. He moved his residence to the construction site about 1965 where he and his family lived in a mobile home. They lived in these temporary quarters for more than a year or perhaps two years. (Once the family moved from its home on Antelope Flats, McCollister moved with sufficient frequency and irregularity that McCollister’s son Michael, who has excellent recall of many aspects of his father’s life, cannot place precise dates to the changes of address.) The next residence was a small studio apartment in the first condominium unit constructed at Teton Village, La Chomine, where they stayed three or four years until they moved to a larger, more conventionally sized condominium in a newer structure at Teton Village, Four Seasons. After a few years at Four Seasons, McCollister moved again to a similar dwelling in the Timber Ridge condominium unit in the same vicinity. He finally built a house at 3580 West McCollister Drive in Teton Village that he moved into in 1979 or 1980. He remained at that residence until his death in 1999. The residential complex on Antelope Flats clearly is the property most closely associated with McCollister’s activity and time period in which he made a contribution of historical significance to the valley. Between 1953 and 1968 McCollister developed the idea, commissioned studies of feasibility, examined alternatives, created plans, found financing, and began construction of the resort complex at Teton Village. In 1965 Teton Village was officially open, and a year later was operating more fully with several lodges, restaurants and a cafeteria, a ski school, plus shops and ski corporation offices. The much more critical aspect, however, was its sixty-three passenger aerial tram (which opened in 1966) rising up Rendezvous Mountain nearly two and a half miles and three double chairlifts, all transporting skiers up the slope. By 1968 the business complex included not only the tram and lodges, but also a condominium apartment complex with eight units, as well as four restaurants, a service station, and more businesses and shops. Teton Village had moved from an idea to reality and its impact was already being felt throughout the valley. The years 1953-1968 proved the most important in reckoning Paul McCollister’s significance and are indicated by a variety of evidence and assessments that focus on the significance of Teton Village for the local area. Fundamentally, the opening of the ski resort transformed Jackson Hole from a relatively isolated village with a very short tourist season in the summer to a year-round busy community that attracted masses of tourists year round. As early as 1967, Morton Lund, writing in Ski Magazine, observed that immediately prior to the construction of Teton Village, “local entrepreneurs who had not taken enough booty to entrain for warmer climes and drier footing spent the winter in the town of Jackson which was unhealthily wet.” That was changing, he suggested. In 1971 one local newspaper announced the significance of Teton Village, when it referred to McCollister and his partners as people who “certainly have taken the shutters off downtown Jackson.” Prior to the development of Teton Village, the only lodging available in the winter in Jackson Hole were two hotels: the Flame (later the Sundance) and the Wort. Writer Donald Hough had written a popular book about what he called the “Cocktail Hour in Jackson Hole,” that long period between the time when the last of the dudes left in the autumn for their homes and when they started to filter back in the spring. With the opening of Teton village, that hibernal “Cocktail Hour” was no more. The planning and construction of the 1950s and 1960s clearly represent the period of critical significance different from the period which followed. Afterwards, Teton Village would hold different challenges and, having already initiated valley-wide transformations, would be more focused on managing the existing operation and refining it. The period of 1966-1968 thus represents a transitional period in the growth of Teton Village. During those years, the corporation moved from development to management as critical missions. McCollister himself announced in 1968 that the project had reached a point where the plans had been laid and the structure had been built and that at that point “the development of Teton Village is largely in the hands of present and future private investors,” referring to the individual business that needed to come to the Teton Village complex. One of his original partners, moreover, observed that McCollister and Teton Village would both have prospered more if he had sold the operation once the tram was constructed (1966). McCollister was universally assessed a visionary planner and a bold builder, but the assessments also agree that routine management proved more of a challenge to him and his performance in that area paled in comparison to the earlier developmental program. And, as his partner suggested, after the construction of the tram, the remaining was routine management. 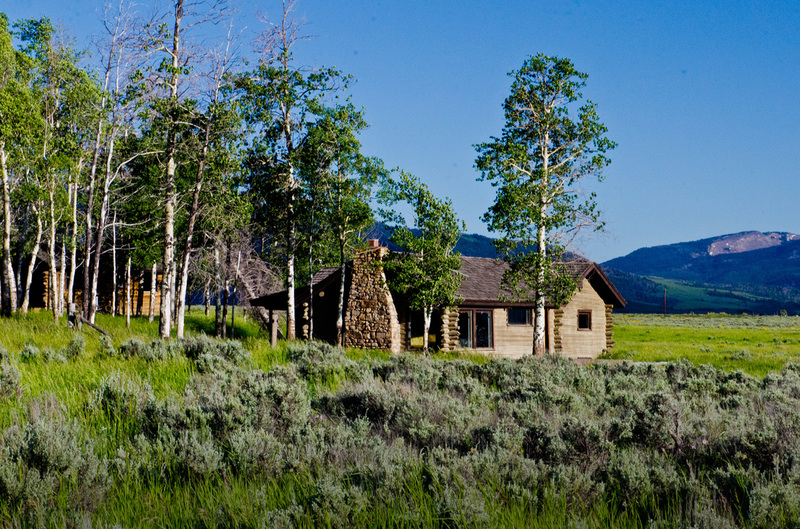 Thus the residence on Antelope Flats most accurately reflects the period and place of McCollister’s significant activity regarding Teton Village. Born in 1915 in Ohio, McCollister spent his early years in Ohio and California and, with his wife Esther, developed a successful career in radio advertising. After service in World War II, McCollister attended Stanford University and in 1950, upon the death of his brother-in-law, for whom he and his wife had worked in radio advertising, he took control of the family business and guided it to marked prosperity. At the same time, he and his wife had been making frequent trips into Jackson Hole because of their passion for skiing and other outdoor activities. Indeed, in August 1950, the McCollisters purchased 10.5 acres on Antelope Flats from Edward Markham. This would in the future constitute approximately half of the tract that McCollister would turn into a family residence. At this point Jackson Hole was in a process of transition. Once an isolated and rustic area known for its scenic vistas and big game, the most prominent form of tourism in the valley had been dude ranches, although they were in clear decline in the post-World War II world. In the late 1920s and 1930s, John D. Rockefeller, Jr., had acquired significant amounts of property in the valley with the intention of turning the land over to the U.S. government to be preserved for its natural and cultural qualities. This land included ranches and dude ranches as well as farms and other properties. In 1943, Franklin D. Roosevelt created the Jackson Hole National Monument, which constituted a separate entity from the small Grand Teton National Park at the base of the mountains. A temporary and somewhat awkward measure that fell short of satisfying either opponents or advocates of setting aside land, the National Monument continued to grow, including more and more property that had not been acquired earlier. In 1949, the Jackson Hole Preserve turned over to the United States government 440 acres in the same section where the next year Paul McCollister would purchase land. That section of land included then government property, remnants of old homesteads claimed and settled or acquired by the Markham and Taylor families, and even included one active farm that produced wheat and hosted an ongoing experiment in lettuce production. At about the same time that McCollister purchased his land from Edward Markham, Congress merged and expanded the Jackson Hole National Monument and the Grand Teton National Park to become a new Grand Teton National Park. McCollister’s plan was to build a home at this place. Others built vacation homes in the valley, but this would become much more than a temporary residence. Exactly when McCollister began construction is not clear and construction indeed took time. It is clear, however, that in 1953 the work was underway. In the summer of 1953 the Park Service called upon A. B. Manly, an appraiser, to examine “unacquired tracts in Grand Teton National Park.” Manly reported that “McCallister” in the summer of 1953 “was actively pushing the construction of a summer home on the tract. He and his family were then living in a tent at the site. He had a power plant temporarily installed, a well contracted for, the foundations and the exterior logs walls [sic] of the house erected in the latter part of July.” While McCollister employed noted log builder Fred Hall of Kelly to build the house, he was personally and directly involved in the construction from the very beginning, including selecting logs with a ranger from the U.S. Forest Service in the Shadow Mountain / Ditch Creek vicinity, blazing trees with a hatchet and stamping them for special harvesting for his house. The family joined in the effort to peel the logs for use in the house. And so construction continued and in 1954 McCollister purchased another 11 acres adjoining this tract from Markham. At the time, the McCollister family was living in the Bay area of California, and each summer over the next several years they returned to this site where they lived. The house was constructed in stages so that it became increasingly livable. Finally, in June 1957, the family permanently moved to the new residence on Antelope Flats for good. This was no easy feat and the expectations were uncertain. The family stocked up with cases and cases of food to prepare for times when they would be snowbound. And the first winter at the new residence proved adventurous, though not to the point where they would be forced to rely on their stockpile of foods for survival. They were committed to the move and the first year their son Mike had to be taken each day by his father driving the family’s Tucker Snow Cat across the Flats to the highway where he could be picked up by the school bus. The following year the road was plowed so that he met the bus at Mailbox Corner (the Y on Antelope Flats Road), and the following year the road was plowed even past the McCollister place. This was their permanent residence. Their nearest neighbors were the Conrad Schwierings to the north and the Andersons at the Hunter Ranch to the east. McCollister operated his business interests from this location and enjoyed the opportunity for hunting and especially for skiing, a sport for which he and his wife had a passion. As he began to ponder the commercial potential of the sport he focused increasingly on the possibility of developing a resort capable of attracting a winter clientele to Jackson Hole, something which simply had not come about yet. An avid skier, he was familiar with established ski resorts in the United States and in Europe and knew well what the potential was and what was required to make one work. As McCollister developed the idea, he enlisted the support of two other individuals, Alex Morley and Gordon Graham, and the three started working together on the project in 1960. Morley had been in the construction business in Cheyenne and Gordon Graham had known McCollister when both were in the advertising business in California and had visited McCollister at his home on Antelope Flats. McCollister took the lead in the exploration and Graham in fact, although he had been working on the project for two years, did not move to the valley until 1962. In 1962 the three formed the Jackson Hole Ski Corporation. McCollister was the president, Alex Morley the treasurer, and Gordon Graham the secretary. These, in fact, were the only three investors. In the new corporation, Graham bore responsibility for public relations and ultimately the sales of lots. Morley’s expertise and prime responsibility was in construction, especially the construction of the tram, the device that formed the single most important part of the entire Teton Village physical plant. McCollister, as president and whose idea the project was, exercised his significant abilities of promoting and selling the project and securing financing for the operation. The Ski Corp, as it was known, hired consultants to come in to work on the project, including Willie Schaeffler and Johannes Schneider, prominent analysts from Europe, who performed feasibility studies. Important friends and associates frequented the McCollister residence on Antelope Flats and its guest cabins, staying sometimes in the cabins as a matter of convenience and necessity as they worked on proposals, financing, contracts, and ideas. The idea and the plans for the Jackson Hole Ski Area became increasingly concrete, land was purchased, and construction began at the base of Rendezvous Mountain in 1964. Finally, Jackson Hole Ski Area opened in December 1965. The tram opened in 1966. It was about 1965 that McCollister moved his family to the location of the developing ski area. Initially they lived in a mobile home and no longer stayed at Antelope Flats. In fact, the sale of the residence to the National Park Service in 1964 appears to have contributed to the development of the ski area by providing important working capital at a critical moment in the project. Following this sale, with Paul and Esther McCollister sharing a life estate on the property, they rented it out to various tenants. And with the move, the action shifted to the west side of the river and valley. The development mushroomed and became increasingly diverse. Not only was it just the ski area, but Teton Village included lodges, a ski school, restaurants, service station, and other tourist-related businesses. Not long after this, the operation changed from a planning and development operation to an ongoing business. In 1967 Graham left the Ski Corp and in 1971 Morley left. The Jackson Hole Ski Corporation flourished and Teton Village grew. Even so, the business did not entirely fulfill the potential and the expectations of McCollister and his colleagues. One associate recalled the circumstance in these words: “The ski area never grew as fast as Paul would have liked, but it was successful and had a devout following of dedicated and accomplished skiers.” Yet the major impact of McCollister’s vision and its implementation had less to do with the business that was transacted at Teton Village than with the changes generated by throughout the valley. The change over the coming years is familiar to all who know Jackson Hole. That project set the example for others. In 1973 Western Standard Corporation, the operator of Snow King Ski Area, received a permit from the Jackson Town Council to begin construction of “a complete recreational complex” to be called Snow King Inn. Amid concerns about the impact of all this development on the town’s infrastructure (such as sewerage capacity, airline service, out-of-state contractors displacing locals), construction on this and other projects proceeded. Jackson had been changed. As for McCollister, he continued to live and work in Teton Village. In 1987, however, he entered a business arrangement that turned sour, that instead of a loan of money to the Ski Corporation was an investment and that meant that someone else then acquired control of the company and McCollister was forced out of the operation he had started. The case remained in litigation until 1992 when a third party (brother and sister John and Connie Kemmerer) purchased the property and renamed it Jackson Hole Mountain Resort. A few years later his wife Esther died. Paul W. McCollister died in Teton Village, April 14, 1999. One consequence of this was the termination of the life estate on the property in Antelope Flats and the transference of the property to the National Park Service.